Ahoy there mate! hope ye be having fine sailing weather, us on t' other hand are not, them blasted cutthroats raided us in the dead of t' night and made us walk the plank! 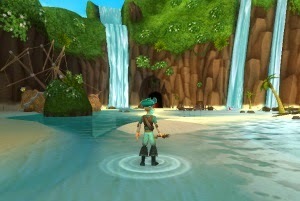 we be stranded on victors isle, (yes i know ironic) by t' isle of treasure (so close!) bonnie me best mate has captured a map from a native showing us to t' city of gold! (tis really silver but in this economy it be good enough) our coordinates be 55,57,1"N 3,11,12"W hurry up lad we be hungry for revenge! Ahoy! me crew 'n I got in a skirmish wit' some nasty ghost ships in th' haunted skyway. We be shipwrecked on a tiny island just outside th' skyway. We don't seem extra welcome by th' local bloodbats. me witchdoctor skills have proved useful 'n I have conjured up 3 huge fires on th' beach 'o th' island. Please send help ASAP! I and me crew be stranded on an island. me ship was on a voyage t' Skull Island. Very soon it started t' rain and a storm began. I steered t' ship t' t' nearest land. T' ship was called Bstarboard Griffin. IT docked was near rocks, when it sank half way. I eat coconuts and edible seaweeds. I have been prisoner o' t' Cutthroats! I Need your HELP!I heard from t' sharks t' place be called Cutthroat Bay.HURRY 'UP Or We be Doomed. Ahoy thar! Please read me message. Don't throw it away. I be seriously in dire need for help. Me ship was capsized durin' a tempest and I landed on a deserted island, which be home t' several mighty Cutthroats. They stole all me valuables and I now be a pitiful vagrant. I mis' me home dearly. I'm afraid that I might die o' hunger or Cutthroats will kill me. I feel like bein' Robinson Crusoe, but I really don't want t' be him. Could you please come with your pirate mateys t' rescue me? It's very simple actually. I be near Skull Island. From north-east, I can see t' big skull on t' main island. I be on this island with hardly any vegetation on. Sometimes those Cutthroats will dock onto t' island. I believe you know how their ships look like. I be now hidin' in an abandoned shack near t' coast. Make aye that you sneak in, or else they might hear you. If you rescue me, I will definitely reward you with lots o' gold, however much you want! Forgive me that some words be smudged because I be writin' with a small piece o' charcoal. Once again, thank ye! Built t' most amazin' sand castle in t' spiral! Just outside o' t' old ruined lighthouse, please come and see! T' who ever finds this im Captain Dark Samuel Walker and im stuck on this island with no treaaye, no loved one, no parrot, and thar's termites eatin' up me peg leg. If you still find this before im went t' Davy Jones' locker chances be im still alive. But i dont care t' be remembered, so i ask you read t' last line o' this letter and then destroy it. Why? Because only a fool would get stuck on an island, huntin' treaaye that dont exist. 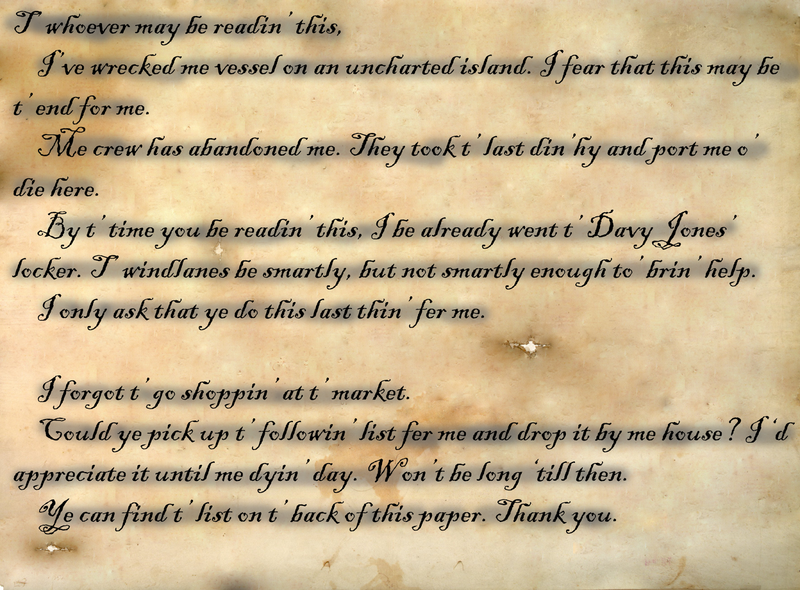 But then again, only a fool would read this letter all t' way through.,If your gonna want t' find me im currently in cutthroat bay on t' shore beside my broken moquistan ship, but if you were t' find me im hidin' behind a giant rock. For goodness sakes, even if i were still alive how would you save me from all these cutthroats? What would i do after i was found? But get lost again and fail t' find even t' easiest treaayes, So do yourself a favor and stop readin' unless you'd really like t' know what t' last line o' this letter is. So do you want t' know? I bet your ready t' skip down and just read it already. BUT DONT! Well you really can't Why? Because im runnin' out o' paper needed t' write t' darn thin'! Avast,I be needin' help.Me shipmates and I were off to deliver somethin' t'Capn' Avery,but we ran into some o' those sharks,and got plundered.I know ye may be busy,but can ye 'elp an ol' crewmate? Mind bringin' with ye a bottle o'yum and one of Vadima's charm?She be owin' me one fer the past three months!I'll tell ye exactly where t'come.So,first ye need t'unbottle yer ship.Probably,unless ye can fly! Then yer to sail through t'skies,find an island lyin' between Corsair's Cove an'that one lizard temple. Avoid th' scurvy dogs,an' the cutthroats,an'the crabs,an'the watermoles.An'the monkeys.An'the fish an'anything else! Now come help me ye scurvy, skaliwaggin', chum chasin', deck swabbin', cackle fruit lovin', swashbucklin', hoodoo masterin',ship steerin',power usin',eye glowin',mask wearin',fast walkin' landlubber! deserted island. Come smartly before 'tis too late, me bucko. T' any one who see this message, I cry out for help.I threw this bottle in t' wind lane because I be shipped wrecked. I be t' lonely Pirate Ruthless Destiny. Me beloved ship was crashed on t' island o' Waponi Wu because o' those Cutthroats. 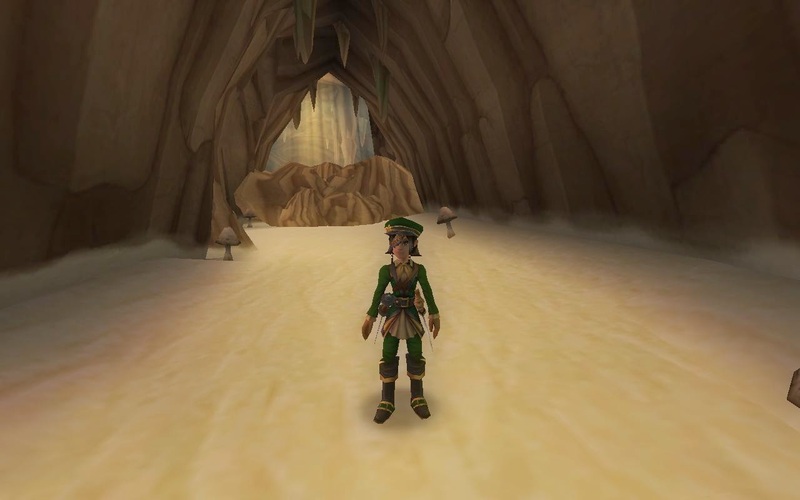 Those Cutthroats busted up me crew and chased me in a cave called t' Tobi Taa Cavern, not far from t' shore o' t' Waponi Wu. If ye can please rescue me by brin'in' your ship here. I be a buckoly pirate who will be happy t' board yer ship. And one more thin', please brin' a barrel o' yum. I know who ya are, I know where ya live. Save yer hero, supreme witchdoctor, Isis Newton, from this strange world, full o' them mystical wizards, or perish through my curse, placed on anyone who reads this. Even yer spirit in yer afterlife will be sure to suffer in agony if you do not come. Ahoy! Young Pirate, I was attacked by a wretched sea monster and was stranded lookin' for me bounty o' treaaye hidden under t' sea. 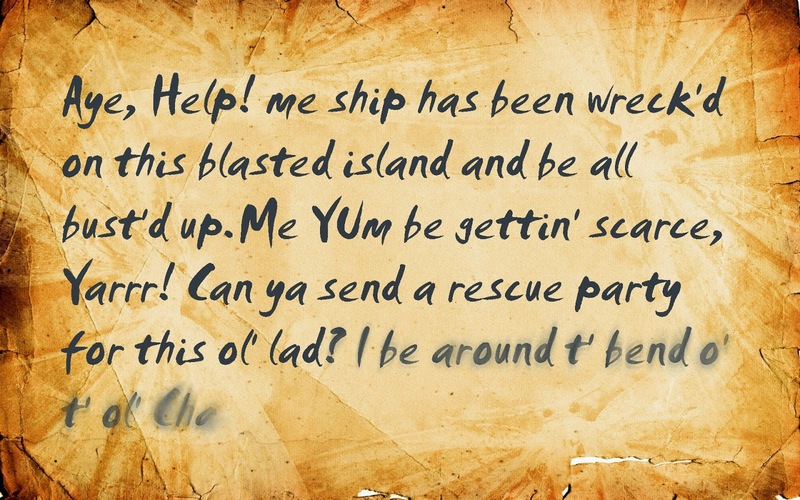 Me ship was destrpyed and i be on a island close t' mooshu and if anyone be readin' please help! me galleon, The Corsair's Pearl. come find me crew in Flotsam Skyway. some gold for yer troubles in tracking me down on this deserted island! My favorite Wizard101 year entry.